Protecting your customers’ property can save you thousands of dollars in repair and replacement costs, but using the right ground protection is the key to success. While wood is often considered the cheapest form of ground protection, it may not be the wise choice in the long run. There are a number of different options for wood mats, including softwood or hardwood and solid or laminated plywood. Plywood is the most popular form of wooden ground protection among many contractors because it is inexpensive. However, this type of ground protection may not be as economical as it first appears. For starters, the porous structure of plywood makes it prone to absorbing a lot of water. This causes mats to become heavy and weak, accelerates rotting and makes them vulnerable to bacteria, insects and rodents. Wood mats provide little to no traction, which can result in a slippery surface for equipment and workers. In addition, the average load bearing capacity of plywood mats can be inconsistent from sheet to sheet due to differences in density, quality, surfaces and weather. The load capacity also deteriorates over time, contributing to a limited lifespan that results in frequent repair and replacement, increasing the cost of wood mats over time. There are numerous benefits to using ground protection mats instead of wood. These rugged mats have been developed specificallyto protect and stabilize surfaces and prevent destruction caused by heavy use. They virtually eliminate damage where vehicles cross lawns, turf, mud and swampy areas, while providing easy movement for vehicles. This makes ground protection mats ideal for a range of uses, from utility and heavy construction, tree maintenance and turf and grass care to golf courses, cemeteries or wherever ground restoration is a factor. By displacing the weight of heavy machinery, ground protection mats help create a solid temporary foundation while reducing the impact of the equipment on the surface below. These mats feature a cleat design that gives vehicles the traction they need to operate efficiently and avoid getting stuck in muddy or sandy work sites. AlturnaMATS offer exceptional strength, durability and protection compared to other ground protection mats, and will save you money if you are currently using wood. Made from ½” thick recycled polyethylene, these mats bend but don’t break, withstand extreme temperatures and won’t rot or deteriorate. They are practically indestructible. The performance of AlturnaMATS is far superior to plywood, providing maximum equipment traction and a load capacity designed to disperse up to 120 tons. 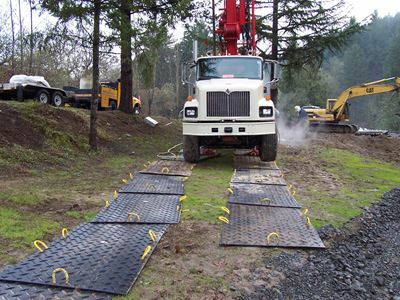 You can build a continuous working platform or temporary roadway in minutes thanks to their easy linking system, which allows multiple ground protection mats to be connected and interlocked. Cleaning is as simple as hosing them off, and you can re-use them over and over again. The company’s Lifetime Limited Warranty means you’ll get the most out of your investment. 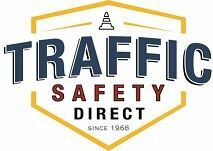 Traffic Safety Direct is an AlturnaMATS authorized dealer, so you know you are getting the real thing. Our 4’x 8' ground protection mats come in black or white, and smaller sizes are also available (call for pricing. ), and fast delivery ensures you will have what you need for all of your spring projects. Order yours today! Still have questions about why ground protection mats are better than wood boards for temporary roadways and work areas? Give us a call. Our knowledgeable sales team is happy to help.